Definition? Colors I like. It’s that simple. No. 03 emilychromatic is the most personal entry in the series. If a quilt is able to tell a story, evoke a mood, or start a conversation, it’s because it’s the product of the care its creator has put into it: the craft, creativity, artistry, and even whimsy. This is no less the case when a quilt is a collaboration between designer, sewer, quilter, and even fabric manufacturer. As color is one of the more emotional aspects of any visual art, emilychromatic takes the series in a new, less abstract direction: where no. 1 monochromatic explored minimal color palettes and no. 2 polychromatic roamed the entire spectrum, no. 3 emilychromatic is grounded in Emily’s own favorite colors. 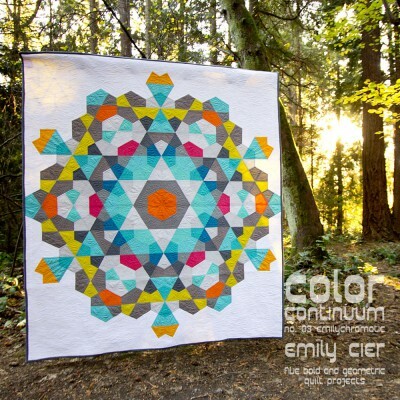 The first three entries in the Color Continuum series were drawn as a whole, most of them during and shortly after Color, Block & Quilt was released. As the quilts were finalized on the computer they naturally started falling into three distinct categories. And then I started sewing … but not necessarily in order. Maybe not the best idea, but sometimes you just want to sew *that* but NOT *that* that day. Thankfully self-publishing gives me the freedom to do what I want, when I want it. No. 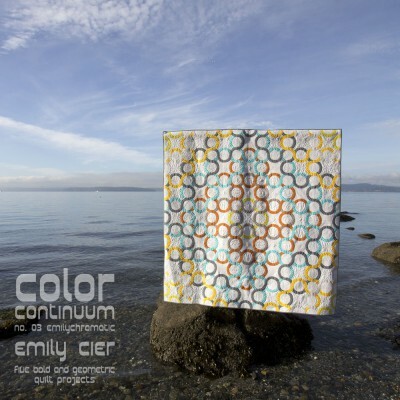 03 emilychromatic is available at a special pre-order price through Monday, December 8, 2014. No. 01 monochromatic, no. 02 polychromatic and no. 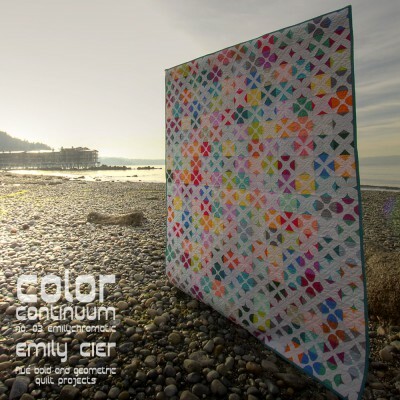 03 emilychromatic are available at special pre-order bundle prices through Monday, December 8, 2014. No. 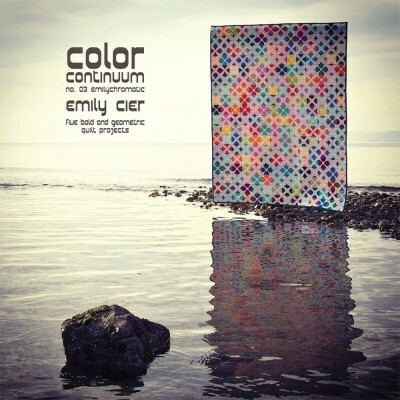 03 emilychromatic is also available on Amazon. Bauble: This was the first quilt I sewed when we moved into the new house in October 2013. The fabric had arrived before the move and it was just sitting there begging to be cut and sewn. Did box #3,284,220 really need unpacking? I love the neutrals of the whites and greys with the splashes of pink and orange with some of the calming blues I love too much. Chi: Chi started out as a run-of-the-mill X quilt. I wanted to do one but it had just been done and done again. Then the chis came to life. Xs but different. Perfect. 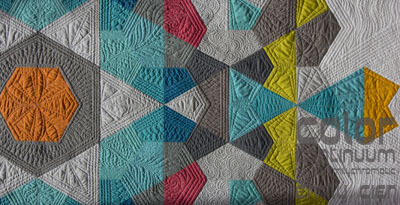 This quilt originally used the Sunset charm pack … but at the last minute that changed. 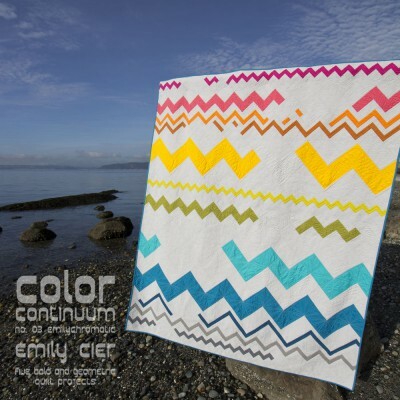 When the Kona Emily Cier Designer Palette started having about the same release schedule as emilychromatic, it was a perfect match and this was the perfect project to switch to the new palette. A little change here, a little change there and ta-da! 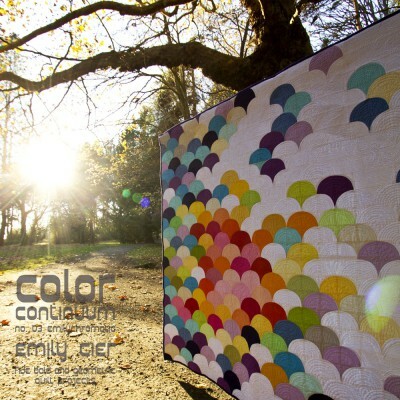 Gloaming: This quilt came to life during the end of Color, Block & Quilt. I was working on some of the curve blocks and made a change here and there and this is what it turned in to. If you are an instagram follower, you know how much I love sunsets. 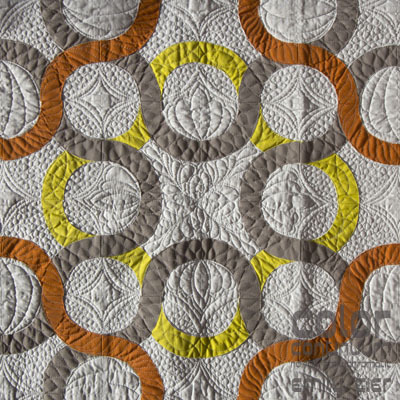 This is the quilted version of the sun shining up on those couple little puffs of clouds while the last bit of sun sets behind the Olympics. Nexus: One quilt I had wanted to try for quite some time is a celtic knot of sorts. I didn’t want it to be super traditional and this is what that idea became. Working out from the middle, with each round a different color and building atop the previous round. On an unreleated note, I’m so happy the weather cooperated for these pictures. 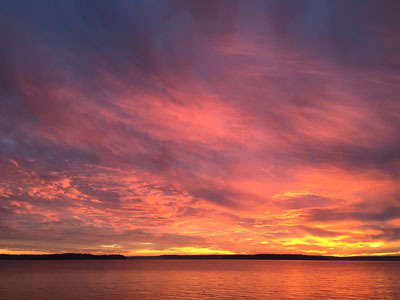 November isn’t always the best for pictures outside around here … ahem. Fracture: This quilt was intended to be full zig-zagged lines with varying widths but in the process of drawing it, I started to like the unfinished, fractured look. It stuck. I loved it. And because I still do love rainbows, I had to add a little bit of a rainbow element to the book. I would like to thank so many people for helping get this release done. A torn labrum in your shoulder does not mix well with quilting deadlines. I’ve always been bad at accepting help, but with four days notice of surgery with three quilts that needed to be sewn and friends are showing up at your doorstep with sewing machines and irons, you learn to say yes. Many, many, many thanks go to Kathy, Grace and Martha for piecing, ironing, binding and in general preventing me from going crazy. Many thanks also go to Angela for quilting all of the quilts and to Ruth for binding those last few and making sure they arrived back here ready for pictures. One last thought: In the 30 Quilts for 30 Years post I mentioned how all my quilts end up with white-ish backgrounds and how I tried to break that in Smithereens. Obviously all these quilts were put together, either on paper or with fabric, before that self-challenge because all of them are white-ish. 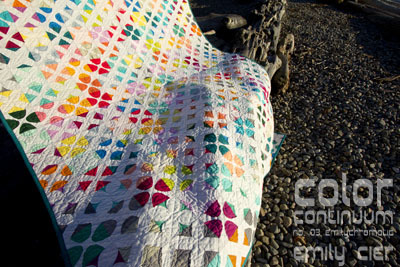 It is emilychromatic, so maybe that’s just a-ok.
Two thumbs up to Snow, White, White (again), Silver and Shadow quilts! Your quilts are wonderful. And the quilting is inspirational. Looking for a pattern or book? Check the shop for paper and PDF patterns! Buy 2+ and save 10%! quilts. color. fun. life. seattle. © 2014 Emily Cier/Carolina Patchworks. All rights reserved. Because the world is better with patchwork.